I'm looking at cross country road race movies this week. 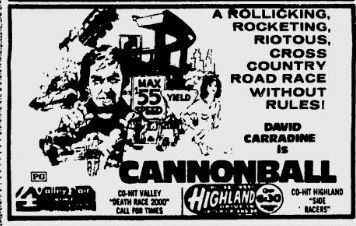 Here's an ad for Cannonball! from 1976. David Carradine plays an ex-con who signs up for an illegal outlaw road race that starts in Santa Monica, CA and ends in a garage in New York City. Along the way he must deal with other outlaw drivers and the mafia who are out to stop him from winning. Carradine's brother, Robert, also stars in the film. The Cannonball Run four years later.